Honey is a food known for its medical properties. 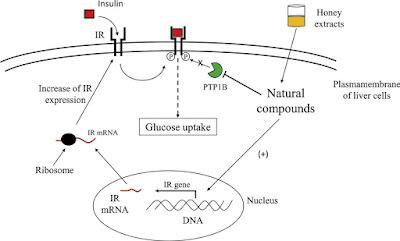 In this work, we have studied the impact of different types of honey on insulin signalling pathway. We found that honey extracts inhibit the enzyme PTP1B, one of the main negative regulators of insulin receptor signalling. HPLC-MS analysis allowed us to confirm the presence of several natural PTP1B inhibitors in the honey extracts analysed. Statistical analysis methods show a correlation between specific 1H-NMR resonance frequencies/HPLC peaks and the inhibitory power of the samples. This finding will allow the prediction of the biological properties of honey samples applying relative simple analytical methods. Finally, we demonstrated that the treatment of HepG2 cells with honey extracts enhances the expression of insulin receptor, and stimulates glucose uptake. 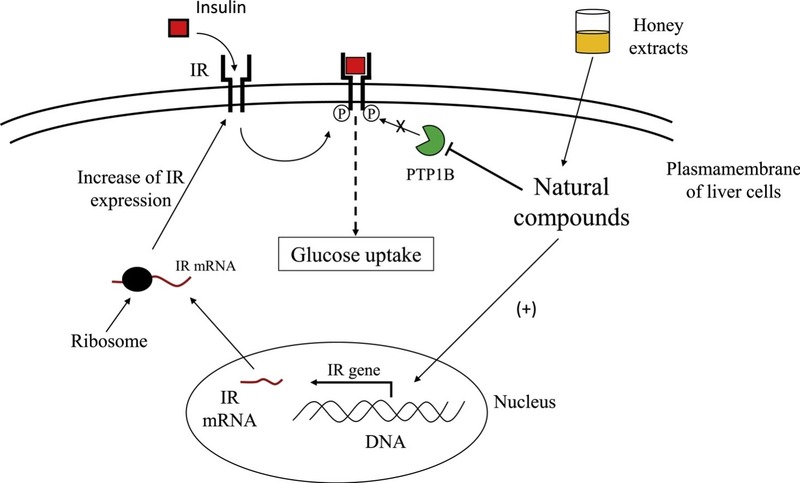 For the first time, our results demonstrate that bioactive components of honey could improve glycaemic control by both inhibiting PTP1B and stimulating the expression of insulin receptor in liver cells.